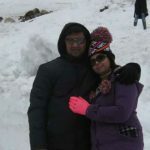 Recently, both I and my partner took an off from the hustle and bustle of working life and went to the Sun-city Jodhpur. We were completely mesmerized with the great splendour and the rich cultural heritage of Rajasthan that is depicted within the city. 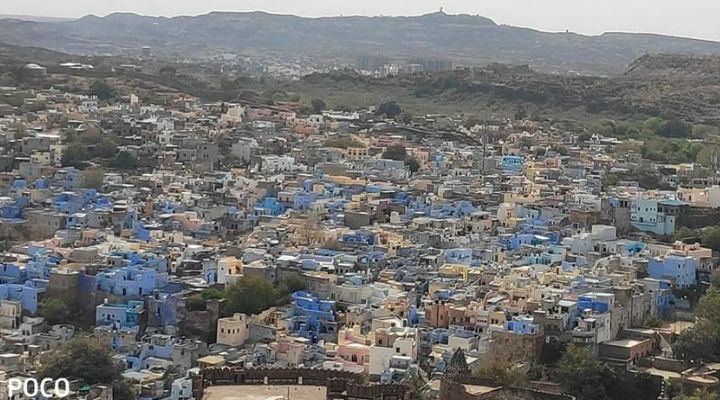 From the palatial houses to the lip-smacking food Jodhpur is an epitome of rich historical past of the state. 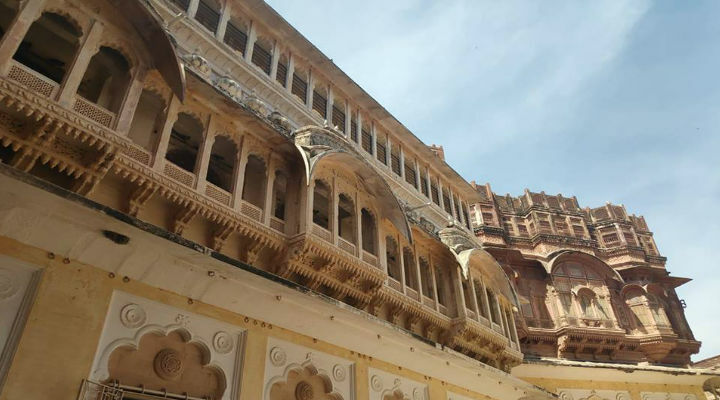 As have heard a lot about Mehrangarh Fort from friends and the community members, as soon as we reached the city, we were so excited to visit the majestic Mehrangarh Fort. Being one of the largest forts in the country, Mehrangarh Fort is also the favourite site for the movie makers. The drive to the fort will make you pass through the narrow lanes which will lead you to the open road towards the foothills. As the city is situated at the edge of Thar Desert, the dust on both sides of the road near the fort is symbolic to the sand in the desert. The rocky hills towards the fort offer a strange bewilderment and awe. Finally, as we reached the fort gate we went through the normal procedure of checking and tickets. Note: Only water or closed cans of soft drinks are allowed inside the fort. No fruit or eatables are allowed. There are small cafes inside the fort from where you can purchase handy food and drinks. The tickets for Indian residents are priced at Rs 100/person. As you enter inside the fort you will be fascinated and amused with the great architecture and the way the fort is constructed. Also known as the Citadel of the Sun, the fort stands as the large colossal and impress you with the way it is created. 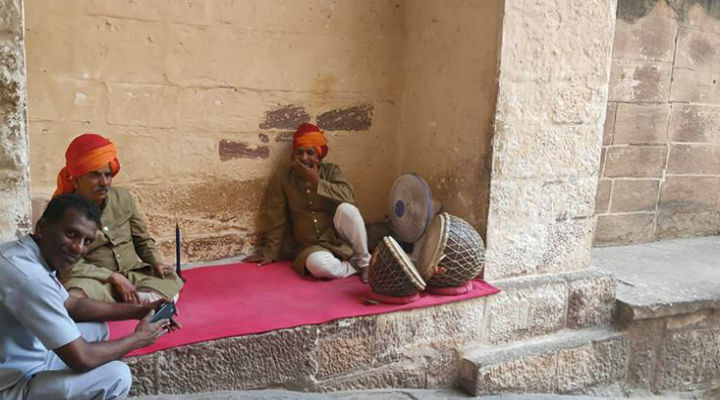 At the gate, two men were sitting fully clad into the traditional Rajasthani attire playing the beautiful music that resonates with the amazing lyrics of Kesariya Balaam Aavo Ni . I felt fully refreshed with this ecstatic welcome at the fort that I completely forgot the scorching heat of the sun at a temperature of about 40 C.
Built with the burnished red sandstone which is quite popular and most of the houses in the city too are built with the same, the fort engulfs rich historical past. As one enters into the inner quarters of the fort where the museum is built one can witness the windows, the Sheesh Mahal, the old temple that lies for hundreds of years, the wall paintings of the royal family and of course the blue houses that can be looked from the top of the fort. Finally, we collected a few souvenirs from the fort museum that has all kinds of Rajasthan artifacts. The fort walls are surrounded with large canons from all the sides and you can instantly go back to the scenes of “Thugs of Hindostan “ and Batman- The Dark Knight which were shot within this intricately designed artistic fort. 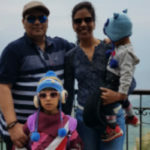 It took almost 1-1/5 hours to explore the whole fort as some parts of the forts are sealed and finally, we had our sandwiches and cold coffee from a cafe inside the fort and headed to the next destination in the bucket list- Jaswant Thada. 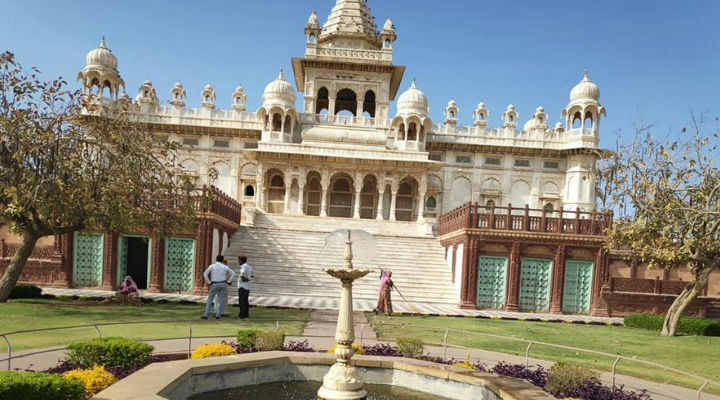 Located just a few kilometers away from the Mehrangarh Fort, Jaswant Thada is a beautiful cenotaph engraved and built with the white makrana marble. The place is located amidst the lush green gardens and the cool lakeside environment. You will be welcomed with the local musicians and the sight of the local womenfolk watering the gardens. 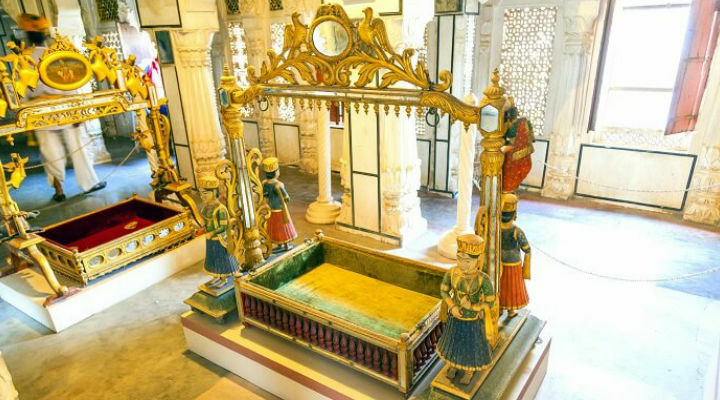 It is a place where the memorials of the deceased rulers were made. Spending not more than 20-25 minutes we headed towards the city as hunger was badly panging us. 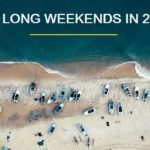 Note: Do book an OLA prior as the chances are the drivers cancel the ride post booking and you have to spend another 20 minutes to book. We literally had to face 2 canceled trips from the OLA driver with a third one finally showing up. 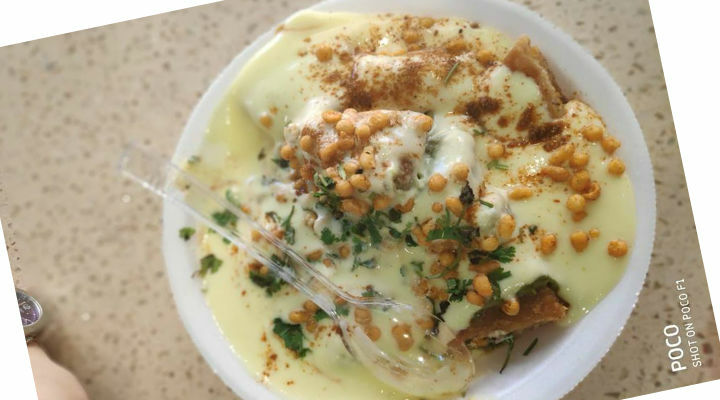 Recommended by a lot of Mompreneur Circle members we had the yummy onion kachori at the Janta Sweet shop. It was super tasty especially the one with curd. We also tried the mirchi bada – green chilli stuffed with potatoes into a besan dumpling. Not to be forgotten is the lassi which though was not as yummy as we get in Punjab still it tasted more like a faluda icecream. 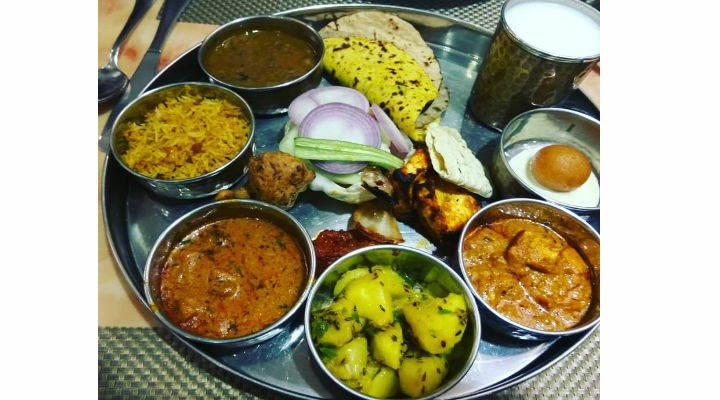 Later we went back to the hotel and had tasty Mehrangarh Thali which included all the traditional Rajasthani cuisines from Bajre Ki Roti, Besan Ki Roti, the Tomato- Lasun Chutney, Papad, Chach, Gatey ki Subzi, Aloo, Rice with lots of dry fruits, gulab jamun in rabri to varieties of Dal. The first day was full of adventure and exploring of the hidden charms of this enchanting city. 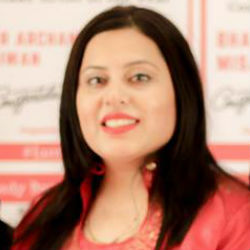 So, the day started with breakfast at the Book Cafe which is run by one of our community member Richa Sharma. The cafe is a must visit place and is a perfect place if you are looking to have some me time in books along with tasty food. The garlic bread, masala lemonade and the grilled sandwiches are highly recommended at the cafe. 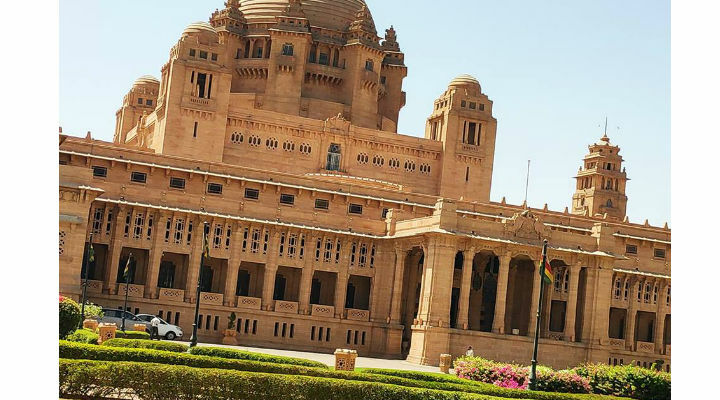 After the delicious breakfast, we headed to the much talked about Umaid Bhawan Palace. Yes, you guessed it right we had the glimpse of the palace in Priyanka Chopra’s wedding and Sabyasachi’s photo shoots. While the palace is divided in three parts in which 1 part is the residential premise of the current royal family and the third part is given to the heritage hotel under the Taj Hotels, the second part is open for the people to catch the glimpse of the royal lifestyle, paintings, vintage cars collection and the material the royal family used. The beautiful bougainvillea blooming in the background amidst the golden palace gives you an indeed royal feel. Note: Always ensure to carry your government ids as they are checked while you enter the palace. If visiting in March-April do carry a cold water bottle. Though you will easily get a Nescafe outlet to enjoy NesTea and Frappe. As it was hot we headed back to the hotel and had lunch over there. 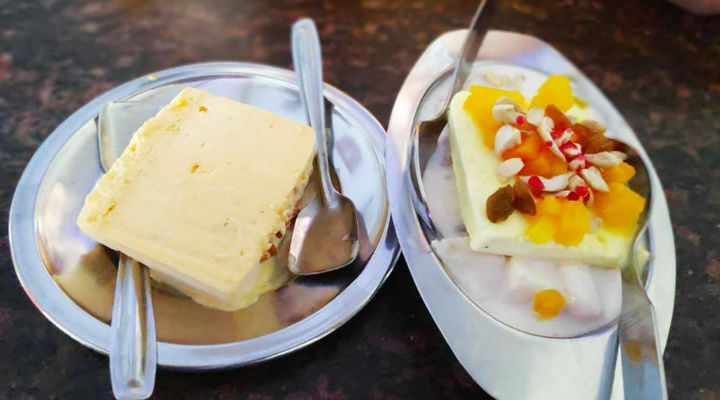 In the evening we went to the famous Parshawanath Ice Cream Parlour at Sadarpulla Market. What a fruitcream and ice cream it has. More than the ice cream it was the humble nature of the owner that fascinated us. While paying the bill we were talking to him and appreciating the taste and quality he offered guava ice cream and orange shake as a gesture to us. It tasted heaven and another must visit place. The dinner was followed by Rajasthan’s most authentic dish with Rajasthani Flavour –Dal Bati Churma with Chach. The only dish with which you can enjoy lots of ghee that makes it tasty. Visiting Rajasthan and not shopping is not at all recommended. After having breakfast we went out for shopping and from hopping one shop to another we finally managed to buy the famous gatchola sarees, kantha work bedsheets, block print suits, batik kurtis. We also managed to have the mawa kachori though not a sweet tooth I liked the kachori and yes the bedmi puri which again was another delicacy. 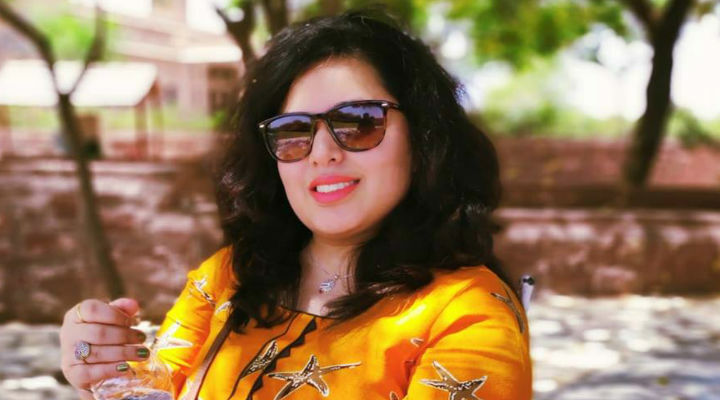 Finally returned back with a lot of beautiful memories of the city and the treat to the Rajasthani food with a promise to visit the city again.